Next Thursday, December 18th it’s the U3A Tod Christmas meeting at Central Methodists – featuring a Punch and Judy Show on the theme of Dickens’ Christmas Carol and a Quiz with a PRIZE for the winners. Plus seasonal refreshments –not just the usual tea,coffee and biscuits! The next General Meeting is on Thursday, 18th September when the speaker will be U3A National Chairman, Barbara Lewis. The title of Barbara’s talk is “U3A and Me and U3A and you”. We are promised this will be a wide ranging talk which will provide the opportunity to find out more about what happens in other U3As and, hopefully stimulate ideas for further developing our range of activities. Read the interview with Barbara in the Todmorden News. The meeting will start as usual at 2.00 pm with the doors being open from 1.30 pm when coffee/tea and biscuits will be available. On the same day, also at Central Methodists, we are holding a coffee morning from 11.00 am – 1.00 pm. which will feature displays and information from all Special Interest Groups so providing an opportunity to find out more about what is happening in U3A. This is open to non-members and so if you know anyone who may be interested in joining U3A please invite them. AND IT IS FREE – EVEN THE COFFEE (and tea and orange, I think) AND BISCUITS! Our April members’ meeting will take place from 1.30 pm at the Central Methodists Hall on Thursday, 17th April, 2014. Nick Littlewood has designed a new poster to publicise this meeting. I do hope you like it. It will be a pleasure to welcome Dave Wilson as our guest speaker. Dave is the Area Countryside Officer for the Upper Calder Valley. His presentation is titled ‘The Protection of our Rich and Natural Environment’ – the work of the Calderdale Countryside Service. I do look forward to welcoming Dave to our meeting and I hope he enjoys his afternoon with us. Alison Greenwood needs more volunteers with the refreshments at our meeting in June. Please contact Alison if you are able to help us or have a word with her at our meeting next week. I need to remind you, yet again, that we are in great need of new Committee members – especially a Chairperson and a leader of the speaker-finders team. Without these key members on Committee our organisation will cease to function. 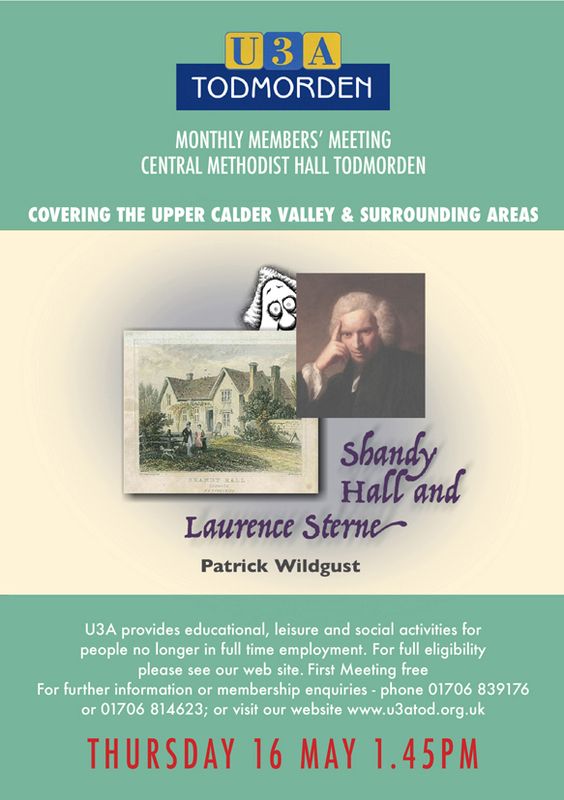 U3A Todmorden provides so much pleasure for our 360 members I do hope you will consider stepping up to make a contribution to the work of the Committee. I look forward to our meeting next Thursday. Our next members’ meeting will take place on Thursday, 20th March, 2014 at Central Methodists Hall. I know you will happy to welcome as our guest Mayor Councillor Karl Boggis of Hebden Royd Town Council. We propose to show a slideshow prior to the beginning of our meeting which was recently compiled by the late Philip Willis. Philip was a very active member of the Publicity Group and its members wish to express their special thanks for all Philip’s work for u3a tod. Additionally, Philip was a great asset to our Photographic Group with his experience, knowledge and passion for photography which he generously and willingly shared with fellow members of the Group. He will be very sadly missed. Our guest speaker – Geoff Carter (Retired GP) is returning with his talk ‘’The Galapagos, Darwin and the Theory of Evolution’. Geoff tells me he has already given this talk to another U3A and it was extremely well received. He will be happy to take your questions at the end. I look forward to meeting you on the 20th. We now have, as our guest speaker in April, Dave Wilson – Area Countryside Officer – Upper Valley – with his talk ‘The Protection of Our Rich and Natural Environment’ – (The Work of the Calderdale Countryside Service). The funeral of Philip Willis will take place at 1.30 pm on Monday, 17th March, 2014 at Priestwell Chapel, Todmorden. 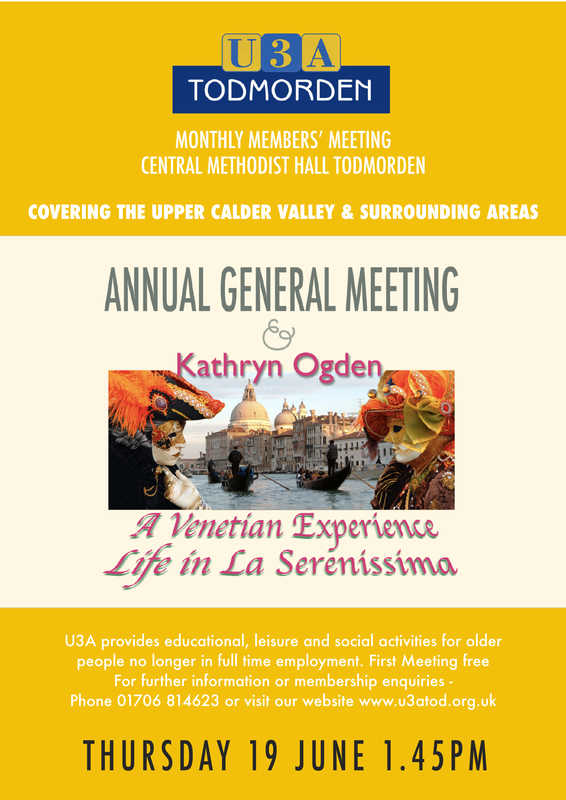 Our next members’ meeting will take place on Thursday, 20th February, 2014 at the Central Methodist Hall, Todmorden writes Chairman Jean Pearson. Our guest speaker will be Barrie Yates with his talk entitled ‘The Machine that Changed the World’ – (The development of the motor car). Barrie tells me that he is what our American cousins would call a value engineer which means that he ran teams carrying out cost reduction activities and also design for manufacture but he says the best description would be that he is a clean hands production engineer! He says that his talk will not be too technical and that he’s enjoyed his research for his talk for us. In fact, we might like to put our brains in gear and ponder upon what have scent sprays to do with a car engine! I know we will give Barrie a warm welcome to U3A Tod and I look forward to our February meeting. Our next monthly members’ meeting will take place at 1.45 pm for refreshments and a chat before the meeting proper at 2 pm next Thursday, 21st November, 2013 at Central Methodist Church. We will be able to welcome our guest speakers from the Institute of Advanced Motorists their talk being entitled ‘Age Old Debate’. There will be a collection box at the back of the Hall for donations, if you wish, to The British Heart Foundation in memory of our late Chairman – David Cross. In addition, there’ll be news of our speakers for the first half of 2014 – from Todmorden to Galapagos, via Venice and India!